Pebble announced today that its appstore is now available on Android devices, ending a long beta period that resolved many of the bugs users were experiencing with previous versions. The 2.0 app also overhauls the user interface, making it easy to pair the smartwatch with an Android phone or tablet, and brings the app and watchface portals to the fore. The app now requires Android 4.0 or higher to work. – Browse, find, and install watchapps and watchfaces for Pebble. – Discover new and most popular watchapps by category: notifications, fitness, daily use, tools & utilities, remotes, and games. 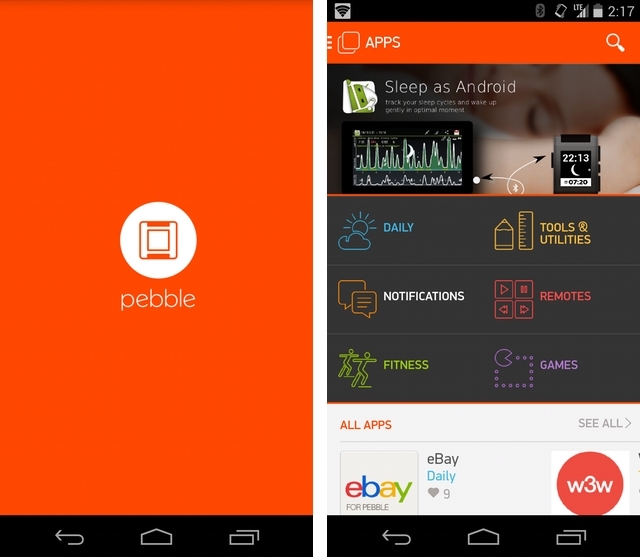 – Watchapp locker: conveniently store your favorite Pebble watchapps when not in use. – Receive notifications when software updates for Pebble are ready to install. – Troubleshoot issues and make suggestions right from the app. In addition to these features, Pebble announced the availability of two new big name apps: Evernote and eBay. The former lets you read notes, view reminders and check off items in a list. eBay’s app lets users “access feeds and discover products” and add items to Watch Lists. It’s not possible to buy or sell items on the smartwatch — probably for the best — but both apps provide as much functionality as is allowed on the black-and-white epaper screen. Unlike the iOS version of the new Pebble app, the Android version doesn’t send all notifications by default. It does mirror calls, texts, calendar reminders, emails, Hangouts and Facebook messages, but you’ll have to download a third-party client like Pebble Notifier to get every notification.